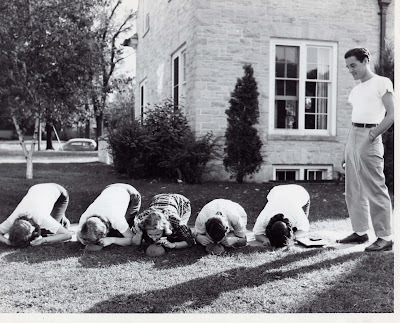 What ARE these five students from the class of 1946 doing on the ground, exactly? Praying? Kissing the earth? Awkwardly hiding from the camera? Actually, they are taking part in the Freshmen Hazing experience! The hazing of freshmen by the sophomore class was a time-honored tradition on the Ripon College campus from the 1940s until the late 1960s. Freshmen had to adhere to a variety of rules, which included a 10:30 p.m. curfew, being present at all football games and pre-game pep rallies, wearing “regulation beanies” at all times outside of their dormitories, and, most importantly, “buttoning” to upperclassmen, as seen in this photo. This hazing lasted until students went home for Thanksgiving break; that is, unless the freshmen class won the coveted grease-pole fight during homecoming (though, unfortunately, this rarely happened).